These days, most everyone's wallets could do with a little extra cash, but it seems to be harder to come by than ever in many cases. So how do you fill the hours? We’ve got good news, because as it turns out, you're in Michigan, and there are a lot of great things to do around here that don't cost any money. Assuming you've got a car and a full tank of gas, or can borrow a couple key implements, you've got the makings of some top-notch excitement. Check out our list of 13 free things to do in Michigan for some of the fun! When “Good Morning America” is willing to refer to a place as “the most beautiful place in America,” then you know you're in the face of some downright dazzling natural splendor. 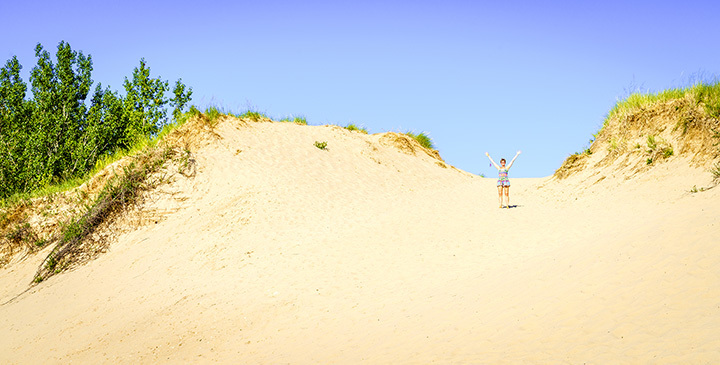 In 2011, that title went to none other than the Sleeping Bear Dunes in Empire, and for those who've seen it, you know there's more than just sand afoot here. 2. Romantic walk on the beach? Right here! The sand in Michigan isn't just dunes. There's plenty of shorefront beach to consider as well, and most of it is available for those who want a walk on the beach. From the Great Lakes to smaller inland lakes, you'll be able to wander the shores in the grandest style, see what's washed up on shore—sometimes it's more than you expect, too, especially on the shipwreck-heavy Great Lakes—or just smell that fresh water air. Recently reopened in Grand Rapids is an attraction called the Motu, a massive tire swing. While it's still under some debate if this is indeed the largest tire swing on the planet, the point we're going to care about is that it actually can be ridden by onlookers. Named for the city's motto, Motu Viget, the massive tire swing was actually part of an event that was the predecessor of Grand Rapids' famous ArtPrize event. It may surprise you to know, but Michigan's road system is pretty much built around getting people to the Great Lakes in expedient fashion. A complete road system—a large portion of which is in Michigan—will readily connect drivers to all five Great Lakes and the St. Lawrence River. Known as the Great Lakes Circle Tour, the road system running alongside the lakes represents 6,500 miles of roadway, all or part of which can be driven at any time. Michigan actually represents an interesting part of maritime history for the nautically-inclined. All the Great Lakes actually interconnect at some point, and thanks to this connection, eventually patch into the Mississippi River and on into the Gulf of Mexico. Known to recreational sailors as the Grand Loop, the interconnected system allows sailors to boat in a circle around the eastern half of the United States. Sailing the entire Grand Loop is regarded as a “bucket list” item for many sailors, so if you've got a boat or access to one, see what all the fuss is about firsthand! Some museums in Michigan do charge admission. Some, however, don't, like the Michigan Iron Industry Museum in Negaunee. Checking out such a museum will allow you insight into the state's history, culture, and even its very identity at its most elemental. It's also a great way to pass the time on an afternoon when an empty wallet weighs heavily on its holder. 7. Free movies on a decommissioned warship? Not only is there a decommissioned warship to check out—the USS LST 393 in Muskegon—but every Friday night, a free movie is shown on the deck. If you can cadge a little popcorn from a friendly Michigander—which isn't unheard of—the night is largely complete. If you'd rather trade for your treats, though, stick around for the next point. If you don't want to show up for the LST 393 movie night empty handed, and you're up for a drive, make your first stop in Clinton County, home of the Sanders Candy Factory. There, you can take a tour and see how the sweet treats are made, and even get some to take home or enjoy right there on the tour. If you can resist the temptation to chow down right there on the factory floor, you've got a nice little quid-pro-quo for getting popcorn at the LST 393 movie. Yes, it's true, Michigan has mountains, and many of them are available for climbing for the particularly intrepid. One particular favorite target for those who want to check out the top of Michigan is L'Anse Township's Mount Arvon, the highest point in Michigan. In an unusual twist, there's even a space at the top known as a “famous Michigan mailbox” where climbers can leave notes behind, a great way to feel connected to Michigan itself. Remember when we said how Lake Michigan was packed with shipwrecks? It isn't the only one. There are enough shipwrecks in Michigan that there are museums about them, and the Great Lakes Maritime Heritage Center in Alpena is ready to show you a complete replica shipwreck. No need to learn how to scuba dive. This one will be ready for most anyone to see. Every fall in Michigan, the trees decide they're going to put on one whopper of a show, and go from their standard green color into a magnificent paroxysm of colors. Red, orange, yellow, even a kind of brownish-red are all on display as Michigan's trees decide, for about a month every year, to show off in the grandest style. Following such an event is known as a "color tour," and lots of these go on all over Michigan. While this is followed by the long, cold winter, it's one fantastic way to say goodbye to warmer weather for a while and segue into Michigan's long chill. It's perhaps the only redeeming feature of a Michigan winter: The snow. While it can make road conditions impassable, blind those in the midst of it, and sometimes even take out power lines, Michigan's famous, huge snowfalls make for plenty of fun, as most any Michigander under the age of 10 will tell you. Whether making snow forts, throwing snowballs, building snowmen or ascending to snow angels, there's a lot to do in those piles of cold white rain on the ground. That's before the issue of "sleds" comes up, if you happen to have one. A Michigan library card is of course valuable as it is for the access it affords to the various libraries in the state, but there's a separate value in a Michigan library card. Take it to a state park in Michigan and show it off. You'll be rewarded with one big surprise: A free one-day pass. That alone may make your day of spending nothing full, but it only gets better. With that same library card, users can get a Michigan Activity Pass, which means free passes to some major cultural attractions.